We believe skin radiance comes from within. 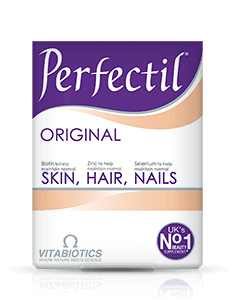 Perfectil Platinum has been developed by Vitabiotics, the experts who formulated Perfectil, the UK's number 1 selling, all round supplement for skin, hair and nails. 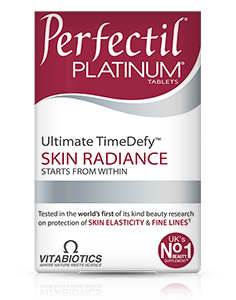 Our in-depth understanding of the processes involved in skin nutrition has enabled us to develop Perfectil Platinum, our ultimate TimeDefy™ beauty formula, which is European Patent Protected. 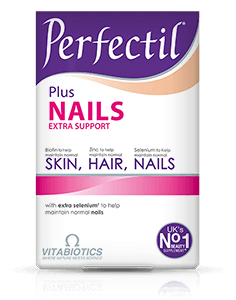 Perfectil Platinum is available in a 30's and 60's pack in the UK from Boots. Alternatively order online here. Maltodextrin, Bulking Agent: Microcrystalline Cellulose, Bio-Marine Collagen (from Fish), Magnesium Oxide, Vitamin C (Ascorbic Acid, [Carriers: Hydroxymethylcellulose, Tartaric Acid]), Silicon Dioxide, Vitamin E Natural Source [D-Alpha Tocopheryl Acetate (from Soya), Calcium Silicate, Silicon Dioxide, Gelatin (from Fish)], Tablet Coating (Hydroxypropylmethylcellulose, Microcrystalline Cellulose, Acetylated Monoglycerides, Natural Source Colours [Titanium Dioxide, Red Iron Oxide]), Pantothenic Acid (as Calcium Salt), Blackcurrant Seed Oil Powder (Gum Acacia, Maltodextrin, Antioxidants [Mixed Natural Tocopherols (from Soya), Ascorbyl Palmitate]), Zinc Sulphate, Alpha Lipoic Acid, Ferrous Fumarate, L-Cysteine, Betacarotene (Starch, Water, Antioxidant: DL-Alpha Tocopherol), Anti-Caking Agents: Stearic Acid & Magnesium Stearate, Niacin (Nicotinamide), Purified Sea Kelp Extract, Standardised Green Tea Extract (Tea Polyphenols, Catechins, Caffeine 4%), Grape Seed Extract, Thiamin (Vitamin B1 as Mononitrate), Vitamin B6 (as Pyridoxine HCl), Vitamin B12 (Cyanocobalamin [Carriers: Citric Acid, Trisodium Citrate & Maltodextrin]), Tomato Extract, Pine Bark Extract, Vitamin D3 (Cholecalciferol [Carriers: Acacia, Sucrose, Corn Starch, Medium Chain Triglycerides, Antioxidant: DL-Alpha Tocopherol]), Riboflavin, Co-Enzyme Q10, Copper Sulphate, Manganese Sulphate, Folic Acid (as Pteroylmonoglutamic Acid), Chromium Trichloride, Sodium Selenate, Biotin. Allergy Advice: For allergens, see ingredients in bold. As with other food supplements, consult your doctor or pharmacist before using if you are under medical supervision, pregnant, breast-feeding, have epilepsy, haemochromatosis, a thyroid condition, suffer from food allergies, or are allergic to any of the ingredients. Made in a site that may handle nuts. Contains low levels of natural caffeine (0.4mg per tablet). Not suitable for children. Food supplements must not replace a varied and balanced diet and a healthy lifestyle. This product contains iron, which if taken in excess, may be harmful to very young children. Why has Perfectil Platinum been developed? How does Perfectil Platinum work? How does Perfectil Platinum help protect skin? How long does it take to experience any benefits in the condition of the skin? When is Perfectil Platinum recommended? 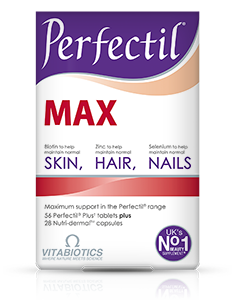 How many tablets does one pack of Perfectil Platinum contain? How and when should Perfectil Platinum be used? 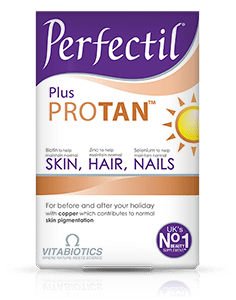 Do I need to take a multivitamin as well as Perfectil Platinum? Can Perfectil Platinum be used simultaneously with medications? Can Perfectil Platinum be taken by individuals who are allergic to fish and shellfish products? 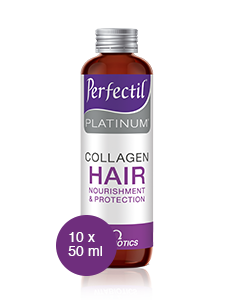 Are there any undesired effects whilst taking Perfectil Platinum? Can Perfectil Platinum be used during pregnancy and breast-feeding? Is Perfectil Platinum recommended with any other Vitabiotics product(s)? The most significant cause of premature skin ageing is sunlight (UV radiation) as well as pollution, smoking and the high levels of damaging free radicals this generates. Antioxidant vitamins E, C and Riboflavin (vit. B2) contribute to the protection of cells from oxidative stress.